The colors were most vibrant on the first cupcake. 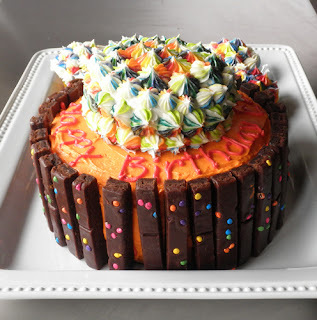 It's my son's 10th birthday today, and I'm about to hit 1,000,000 page views here (woo hoo! ), so I'm doing it up, making rainbow cupcakes to go with the chocolate cake with orange frosting and Little Debbie Cosmic Brownies that he requested. 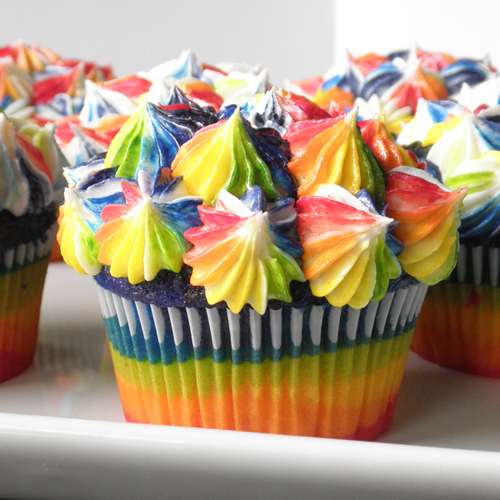 I've been wanting to make rainbow cupcakes for a while, and, sorry Ezra, this was the perfect opportunity. When mulling over how to frost the cupcakes, I played with all sorts of ideas in my head, but eventually decided to try out what I'd seen on Pinterest, from Chica & Joe. It involves painting the interior of a piping bag with gel food color, so I was sort of intimidated, but it was actually not as hard as I'd anticipated, and I love the results. Now, I need to finish up this post and clean up the front room for the company coming for chile colorado burritos in a few hours. Preheat oven according to package instructions. Mix cake mix according to package instructions (or make some from scratch, if you'd like). Place open zip top bags into cups, folding the tops over a little bit so they stay open. Pour approximately equal amounts into each baggie. 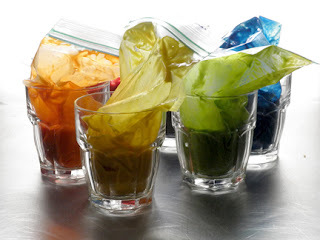 Add about 1/2 teaspoon gel food color to each color (each a different color, of course). Zip one baggie at a time and smoosh around until color is completely mixed in. If colors don't look vibrant enough for you, mix in more gel color. Bake according to package instructions. When done, remove from oven and allow to cool in pan for 5 minutes and then take cupcakes out to finish cooling on a wire rack. 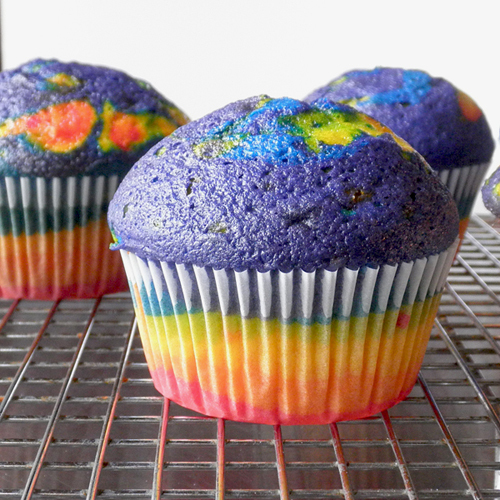 When cupcakes are completely cool, they're ready to frost. This method/idea comes from Chica & Joe. Brilliant. 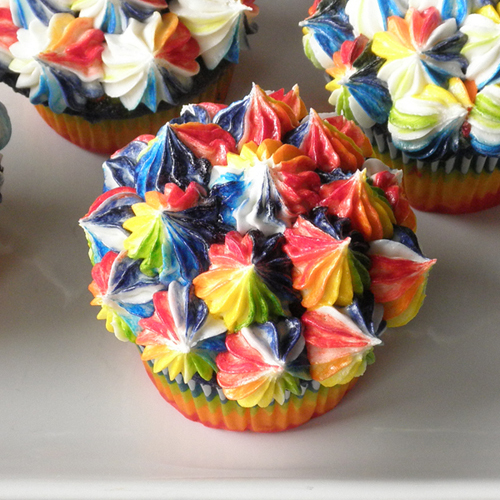 Get your piping bag ready with the tip and place in a cup that will support it. Squeeze about a 1/4 teaspoon size blob of each gel color onto a clean plate. Remember which order you squeezed them in if that matters to you. If you're using the Wilton gel color that is not in a squeezable container as Americolor is, I suppose you can just stick the paintbrush into the container.) One color at a time, and rinsing and completely drying brush between colors, paint on a stripe of food color from the coupler up the side of the piping bag, as high as you expect to fill the bag. (I only went halfway up. See Chica & Joe for some great detailed photos.) Repeat with each color, being careful to use appropriate spacing. Remember you have 6 colors. Carefully spoon the buttercream into the bag, making sure to leave enough room to twist the end closed. After twisting the top closed, squeeze a little frosting onto a plate to get started. Then frost cupcakes. Color will probably fade as you go on, but will still look pretty. *Note: I filled one bag and it frosted 6 cupcakes and a mini cake. You might have to go through the process twice or more if you're frosting 24 cupcakes. I'll try it out someday and let you know, but for now, I only did a few. These were filled to within 1/4 in of the rim. I think they're cute just like this. In a large mixing bowl, beat together the butter and shortening. Beat in the sugar, vanilla, salt, and 1/4 cup milk. Add a little more milk, a teaspoon at a time until you reach the desired consistency. If you go overboard with the milk, beat in more powdered sugar. Cover with plastic wrap if you won't be using it immediately. I'm not sure why I started cutting potatoes like this sometimes. I started years and years ago, and actually, I haven't done it in a while. I'm pretty sure I must have seen some Food Network chef do it one time and it looked good. I probably should have taken pictures of the process of cutting because it is rather unusual. You cut just the end off the potato, and then you cut at an angle and give the potato a quarter or a third turn and cut again so you end up with odd angles and edges to your cut potatoes. I kind of think of a gem cut as II'm cutting them. What you end up with after frying is a bite of fried potato that is thick and tender at one end, and around two or three of the edges is thin, browned and crisp. Tonight I used red potatoes, but I've also done this cut on russet potatoes. I mean, any kind of potato tastes good fried as far as I'm concerned. It's just a fun way to mix things up. Wash and dry potatoes. With a sharp knife, cut off a quarter inch end of a potato and then starting in the center of that cut, cut potato at an angle. Turn potato a quarter turn and cut again from the center. 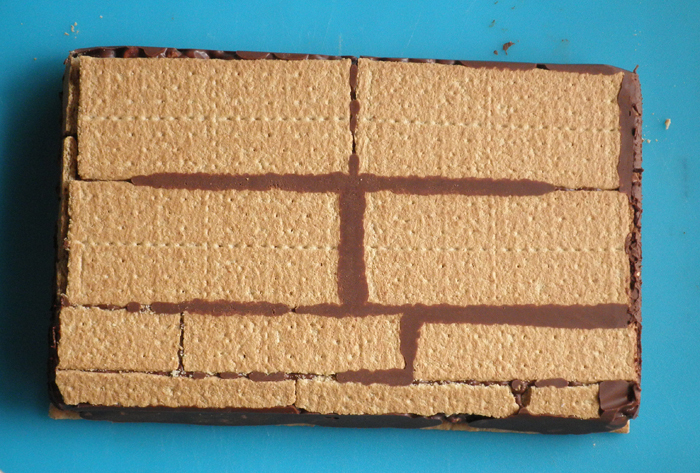 Continue doing this, making sure you're cutting pieces that are approximately equal in size. Place 1 inch of canola oil in a large high-rimmed frying pan. Turn heat to medium high and place potatoes in the oil. Do not preheat the oil. Put the potatoes in when the oil is still cold. Allow potatoes to fry until they start browning slightly at the edges before you stir with a slotted metal spoon. Continue to fry, stirring occasionally until potatoes are as browned as you like. Remove with the slotted metal spoon to a paper towel lined plate and sprinkle with salt and pepper. Light, crisp puff pastry surrounding an almond paste & sugar filling. I'd never even heard of Dutch letters until I moved to Des Moines, Iowa. Apparently they are one of the things to get when you go to the Pella Tulip Time Tulip Festival in May. 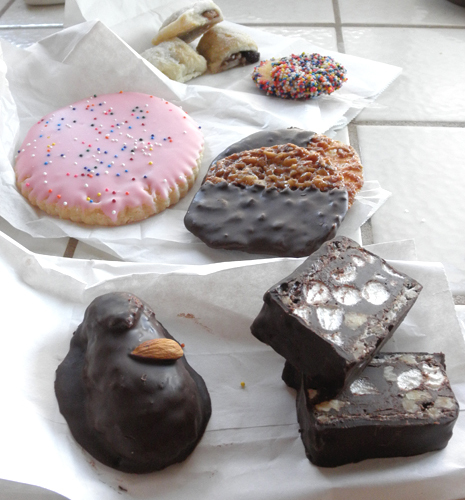 Jaarsma's Bakery is probably the most popular bakery in Pella. That's exactly where I tried them for the first time, and although I don't crave them like some people do, I enjoy them when I eat them. They're simply puff pastry surrounding an almond paste and sugar filling. That's really it. Just light, crisp pastry with a sweet center. Good stuff. I was making some puff pastry just for the heck of it today (I really need to stop doing these things, by the way) and I thought it was a good opportunity to use the almond paste I'd bought almost a year ago to try out Dutch letters. The actual pastry recipe I've seen is much less complicated than the puff pastry I made, and it tastes just as good and comes out just as flaky. I'm a glutton for complicated baking, though. Next time I'll try the complete Jaarsma's Dutch Letter Recipe that I found on the Midwest Living Magazine website. Thanks, Jaarsma, for being so generous with your recipe. Oh, and please note that I didn't make a double recipe of puff pastry dough. I just ended up with twice as much of the filling ropes as I needed, so I suggest making the double batch of puff pastry dough, unless you don't want lots of these Dutch letters and you don't feel bad about throwing away food or attempting to freeze it for another time. 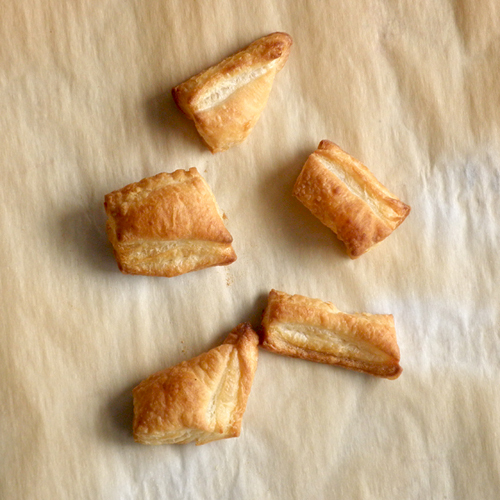 Make puff pastry dough or buy some Pepperidge Farms Puff Pastry Sheets. Mix the almond paste, white sugar, brown sugar, and egg white thoroughly. (I started with a fork and then just used my hands.) Roll almond/sugar mixture into thin snake-like strips about 3/8-inch in diameter. It's okay if they break and/or aren't perfect. Cover with plastic wrap and set aside. Take dough out and on a lightly floured surface, roll to a little less than 1/4-inch thickness. Cut 10x2.5-inch strips. 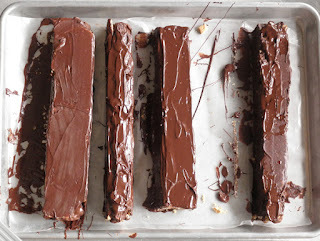 Brush one long edge with a little water and then place almond/sugar strip down the middle. Break off excess or add more if needed. Roll dough over almond/sugar onto the wet edge and press down slightly to seal. You can also pinch to seal to make sure it's well sealed. 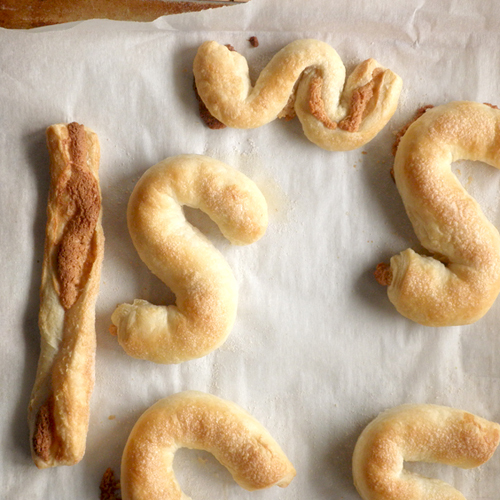 Form into a letter "S" on a parchment-lined baking sheet. (At this point you can also cut logs into threes to make reasonable sized sticks.) Repeat with remaining dough. You should be able to get 4-6 letters on a pan. Refrigerate remainders until ready to bake. When ready to bake, brush with a little water and sprinkle with some sugar. Bake at 375 degrees F for about 20-25 minutes, or until well-browned on top. Let cool on pan 5 minutes before removing with a spatula to a wire rack to finish cooling. A pizza cutter and a quilting ruler are perfect for this. That's about how they look before rolling. Dutch letter sticks just cut. that exact statement somewhere else in this blog. 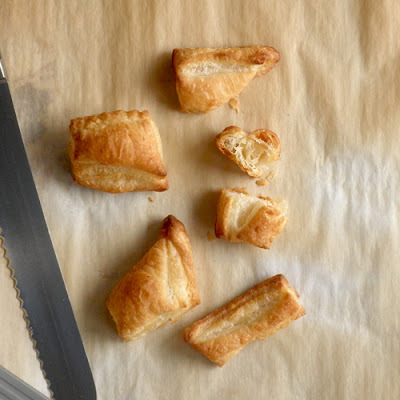 Puff Pastry Scraps. Light and crisp. I probably should have realized when I was making puff pastry as a teenager, that I had a deep passion for food and the making of it. 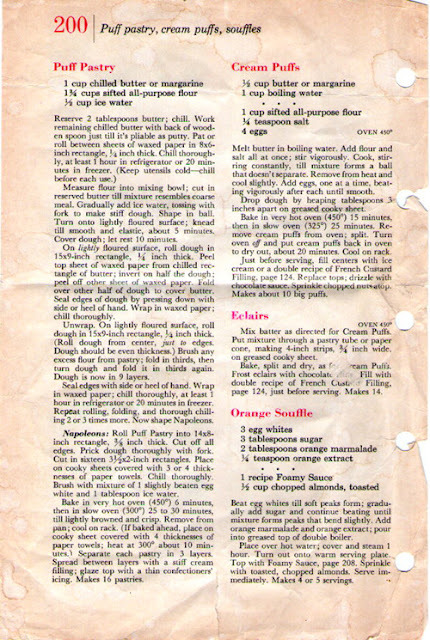 This recipe from The Better Homes and Gardens Cookbook (published in 1962) is the recipe that taught me how to laminate dough. My first attempts at croissants shortly afterward were unsuccessful, but with this recipe, I tasted success. My mom would often purchase the Pepperidge Farms Puff Pastry Apple Turnovers. They came frozen in a paper bag within the box, and they were unbaked. I was absolutely fascinated with how they went from these pale, flat rectangles, into a browned, puffed, crisp and tender work of edible art. I don't think I liked eating the apple filling, but would tear away chunks of the puff pastry and let it melt on my tongue. It was a virtual culinary miracle, one that I discovered I could reproduce. I haven't made puff pastry in eons, but I found this page from the Better Homes and Gardens Cookbook today, and was inspired to neglect my housecleaning for this. It's no wonder my house is a constant cluttered mess, but at least we are well-fed. The recipe I've typed out for you is my adaptation of the recipe in the page pictured. I apologize for the back and forth about the stand mixer and the bowl. I use a Kitchen Aid, but I try to realize that all of my readers do not. If you ever have any questions about a step where I mention a stand mixer and you don't have one, please comment below or email me, and I'll do my best to answer your questions. Reserve 2 tablespoons butter in the refrigerator. Cut remaining butter into 1/4 inch slices. In the bowl of a stand mixer fitted with a paddle attachment (or in a large bowl, working with a wooden spoon) mix chilled butter slices on low until it's "as pliable as putty." With a silicone spatula, scoop butter out onto a large piece of wax or parchment paper and form into a 1/4-inch thick, 8x6 inch rectangle. If you have an offset spatula, you might want to use that instead of the silicone spatula. Wrap butter rectangle in the wax paper and chill for at least 1 hour in the refrigerator or 20 minutes in the freezer. Cut reserved 2 tablespoons butter into 1/4 inch slices. In the bowl of the stand mixer, place the flour. With the paddle attachment (or with a pastry blender if you're using a regular bowl), mix in the reserved butter until mixture is like coarse meal. Switch to the dough hook and gradually add ice water. Kneed on low speed until smooth and elastic, about 5 minutes. Cover and let rest in the refrigerator for 10 minutes. 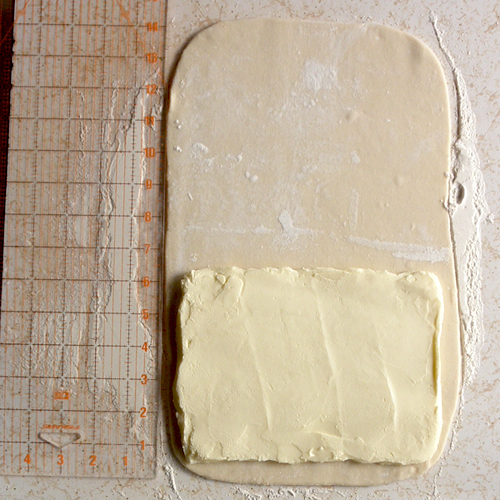 On a lightly floured surface, roll dough into a 15x9 inch rectangle. 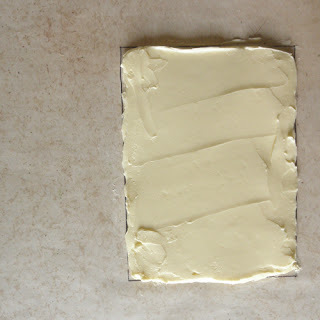 Carefully unwrap butter rectangle and place on top or bottom half of the dough rectangle. Fold over the other half of dough to cover the butter. Seal the edges with the side of your hand. 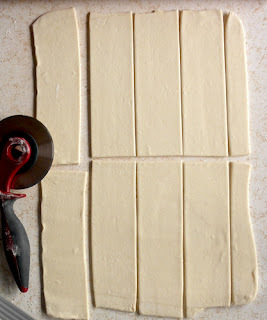 Roll dough into a 15x9 inch rectangle again. Roll from the center out. 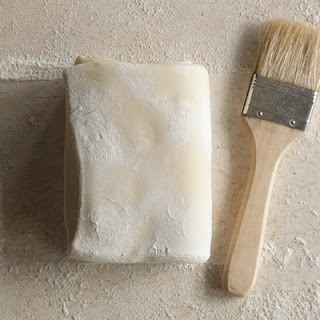 With a clean pastry brush, brush any excess flour from the surface. Fold in thirds. Turn dough and fold in thirds again. Dough is now in 9 layers. Seal edges with the side of your hand. Wrap in wax paper or plastic wrap and chill thoroughly, at least 1 hour in the refrigerator or 20 minutes in the freezer. Repeat rolling, folding, and chilling 2 more times. Now that you have your puff pastry dough, you can roll it to 3/8-inch thickness and make some other things like Napoleons, Dutch Letters, fruit turnovers, cute shapes to serve with chicken pot pie soup, like Jason's Deli does. 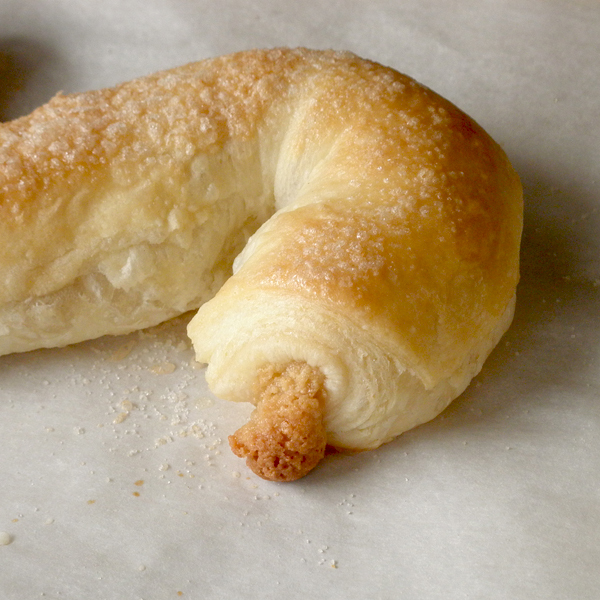 See Pepperidge Farms website for lots of ideas on how to use puff pastry. on the other side of the wax paper. 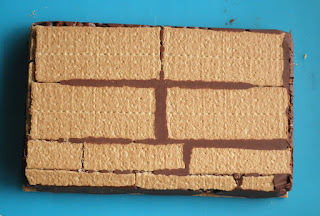 to measure when baking things like this. Dough with butter layers inside, ready to chill. 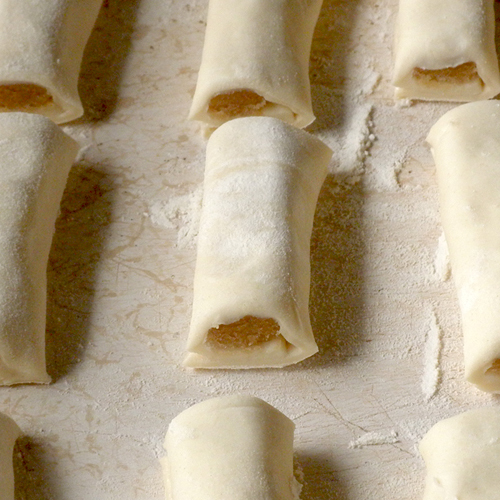 Puff pastry dough rolled out. Yes, it does taste as good as it looks. One sure sign that the new school year is upon us and that I will return to work soon, is that I get into a food/baking frenzy. Yesterday it was white chocolate macadamia nut cinnamon rolls. Today it's chocolate ice cream. The other day while eating frozen yogurt, one of my boys asked if it was really yogurt. "Yes, it is. That's why it's named 'frozen yogurt.'" Hmmm. I guess it's an honest question from a 10-11 year old boy. That got us talking about how to make frozen yogurt and ice cream and somehow I mentioned our ice cream maker. "We have an ice cream maker?" Ezra asked. "Well, yeah. We just haven't used it in a long time." Like a longer time than what you can remember. "Why don't we make some ice cream soon?" 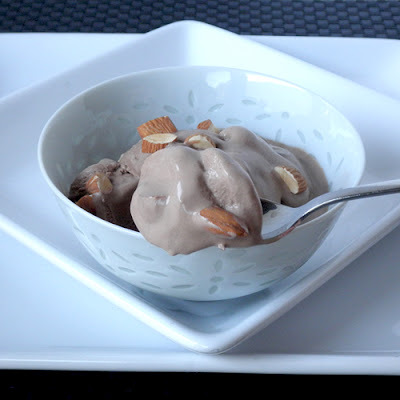 So, here I am, with one of my favorite ice cream recipes. It's very chocolatey and very smooth and creamy. 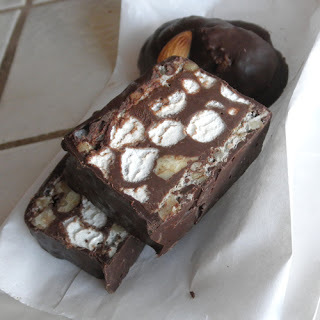 The almonds are added because chocolate almond ice cream one of my husband's and 10 year old's favorites. I've also been known to eat a scoop or two myself. I found this recipe so long ago, I don't even know where I found it. I've changed a couple of things, so technically, it has been adapted. As always, if you recognize it as your work, please let me know so I can give you credit. If you decide to make this, or any other ice cream that requires a cooked base, be sure to do it a day ahead, or at the latest, the morning you plan to freeze it. The colder the base the better. 1. In a large heat-resistant bowl, beat eggs lightly with a whisk. 2. Beat sugar into the eggs until incorporated. 3. In a medium or large heavy saucepan over medium low heat, heat the milk, 1 cup of the cream, chocolate and salt. Stir pretty regularly until the chocolate starts to melt. 4. When chocolate is partially melted, whisk in the cocoa powder. Then continue stirring to melt the chocolate. 5. When hot (and chocolate is fully melted & cocoa is dissolved), but not boiling, remove from stove and gradually stir into the egg & sugar mixture. Start with only 1/4 to 1/2 cup of the hot mixture so you don’t scramble the eggs. Then pour in the rest and mix thoroughly. 6. Add the second cup of cream and the vanilla extract. Stir well. 7. Transfer mixture to an airtight container and refrigerate until COLD. This will take all day or all night. 8. 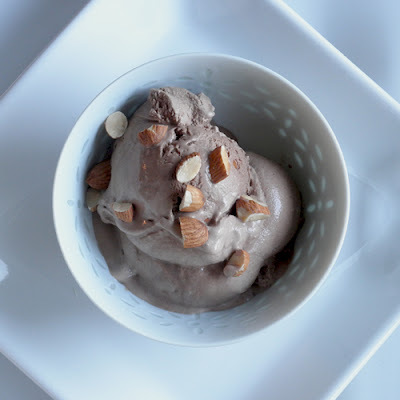 Using an electric ice cream maker, freeze ice cream according to manufacturer’s instructions. 9. Transfer to a container you can seal and stir in the almonds to evenly distribute them. Freeze for about 1 1/2 to 2 hours before scooping and eating. Makes about a half gallon. I found the picture of these lovely potatoes onto my "Beautiful Food" board on Pinterest a while ago, but I'm only just now getting around to trying them out. The recipe comes from Culinate, which I also only just visited to get the recipe. I'm going to have to poke around that website some more when I take a break from baking and blogging. I love, love, loved these potatoes: super crispy and salty on the outside, soft and creamy potatoeness on the inside. Very, very satisfying. 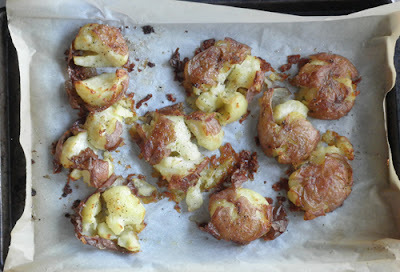 My potato loving son loved these too, but my husband thought they were too greasy and placed his on a napkin to drain. I liked the oil just fine. Next time, though, I think I'll smash the garlic more to hopefully infuse more of its flavor into the oil. Plus, I will probably follow Culinate's instructions and microwave the potatoes instead of boiling them. I will definitely be making these babies again. Place potatoes in a large heavy saucepan and cover with water. Add about 2 tablespoons of salt to the water. Bring to a boil over medium-high heat and boil for about 30-40 minutes, or until a sharp knife inserted into a potato slips out easily. While the potatoes boil, place a small saucepan over medium-low heat. Pour in the olive oil and garlic cloves. Heat garlic cloves, stirring occasionally, until they turn light brown. Remove pan from heat and set aside. Drain off the hot water. Place potatoes on a baking sheet. Using the bottom of a mug, carefully smash each potato. Some will break into pieces, and some will just smoosh a little. Remove the garlic cloves from the oil and either discard or save for another use. Drizzle oil evenly over the smashed potatoes. Salt and pepper potatoes to taste. 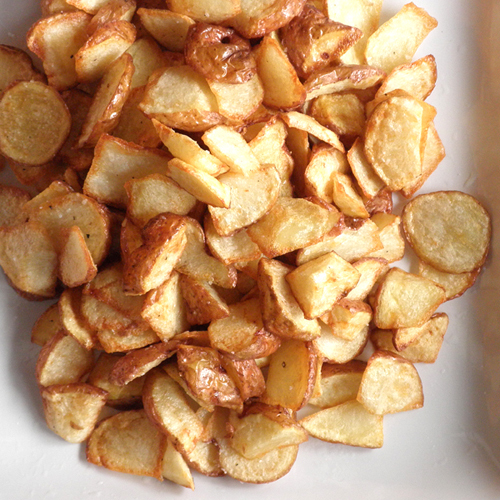 Roast potatoes at 400 degrees for 25-35 minutes, or until crisp and brown on the edges. 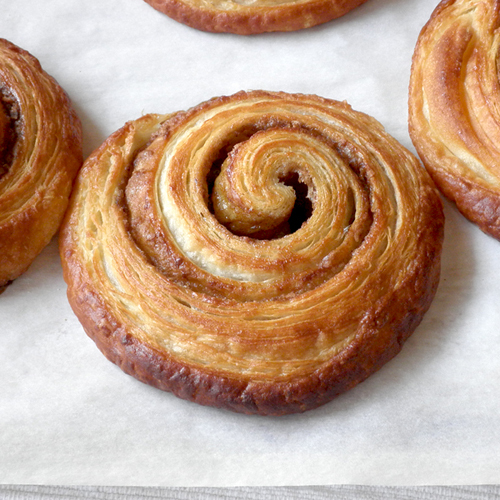 Yes, this cinnamon roll is made with croissant dough. Well, today is the first day of the Iowa State Fair 2012, which means it's also the day of the Tone's Cinnamon Roll Competition. This is the first year in six that I won't be competing. Part of it is because I just got back from a month in California (working and visiting family), and part of it is that I think I'm still bitter from last year's competition (see German Chocolate Cinnamon Rolls). Since this is my blog, and I can say what I want, I'm going to take the time to go into my sad "first world problem" story. I realize that in the light of eternity, this is not even a grain of salt, but I'm going to indulge myself. Skip down to the recipe if you don't want to know the sordid details. When I moved to Iowa back in 2005, I was not yet eligible to enter the competition for that year. So the next year I entered, and my big winner was Nanaimo Bars. That year I realized that the BIG prize was in the Tone's Cinnamon Roll Competition. There were two classes in this certain competition: Cinnamon Rolls (sticky-caramel, with or without nuts) and Cinnamon Rolls (plain-frosted or unfrosted). First prize in each class was $500, and the overall winner got $3000. That means that if you won overall, you really won $3500 in all, because you have to have won first place in your class to be in the running for best overall. I wanted the big money, so I got to work on making cinnamon rolls. 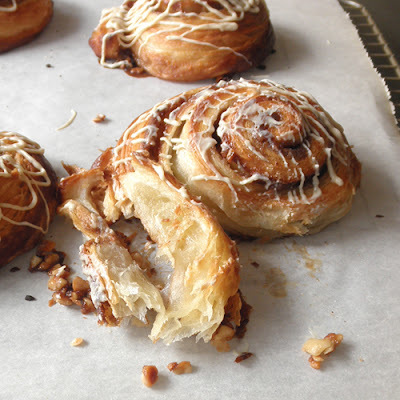 My first year I made a macadamia nut sticky bun and honey wheat cinnamon rolls. They were reasonably sized and delicious. Well, they both went immediately to the reject table after being tasted. Bum-mer. When I checked out the winning rolls later, I noticed that they were ridiculously large. Other than that, they left me unimpressed. The next two years I tried to go bigger, to no avail. I still went to the reject table. 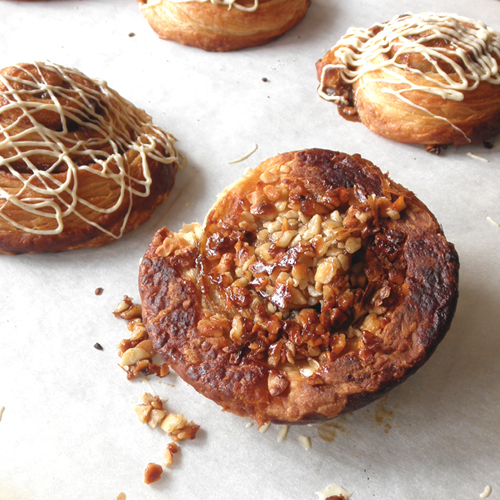 I also tried to mix things up by using croissant dough for my sticky buns and I sometimes used pecans, sometimes macadamia nuts. I was frustrated. I knew my cinnamon rolls were delicious, but so were most of the other ones presented to the judges. How was I ever going to stand out? What was the secret? These thoughts consumed me most of the year as I tried roll after roll out on family and friends. They weren't complaining, but I knew there had to be some secret I wasn't in on. 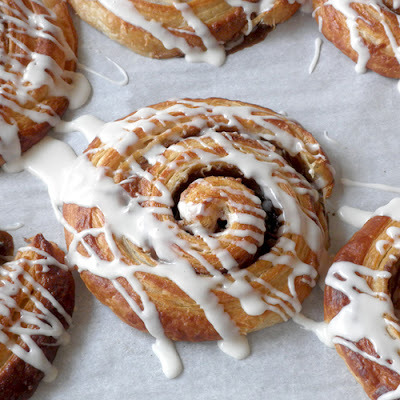 Well, when the premium book came out for 2009, I noticed an addition to the cinnamon roll classes: Non-Traditional Cinnamon Rolls. Had they taken note of my crazy efforts to stand out and decided to make an entire class for these non-conformist but delicious rolls? I like to think they did it for me, but I have no evidence. That year, I decided to make these rolls. My inspiration, obviously is from Mrs. Field's white chocolate macadamia nut cookies. Trial runs turned out well and got good reviews from family and friends, and the day of the competition they turned out perfectly. Golden brown, buttery, flaky, with a nutty caramelized bottom and a little white chocolate drizzled on top. One of the judges said they transported her to Vienna, where she imagined eating one while sitting at a cafe. In the end, they won first place in the Non-Traditional Cinnamon Roll class, and I was $500 richer. The judges loved them, and I felt vindicated. Sure, I didn't win the big prize, but then, once that happened, I wouldn't be allowed to enter any more. This way, I could keep on entering. So the next year in my preparation, I was leaning toward a bacon sticky bun--you know, using fried bacon bits instead of nuts. Only a few people really LIKED those rolls. They mostly had the novelty of bacon going for them. Then, it came to me: pulled pork cinnamon rolls. I made them; they won; and I started this blog (see Pulled Pork Cinnamon Roll post for details). 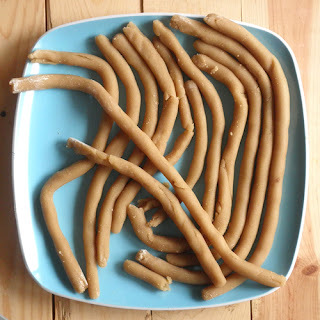 So, this year, instead of entering the competition, I am at home with my son, making this older winning recipe and blogging about it. Maybe next year I'll have the time and the will to enter again, but for now, I feel good about not entering the fray this year. One day I really need to write a post about the darker side of food competition. It might just be cathartic for me. For now, I will nurse my bitterness and make more people fat. I hope you enjoy the recipe. Thanks for listening. 1. Whisk 3 cups flour together with the yeast, sugar, and salt in a medium bowl. Place the milk in the bowl of a standing mixer fitted with the dough hook. Add the flour mixture and kneed at low speed until a ball of dough forms. Cut the 2 tablespoons butter into small pieces and add to the dough. Continue to knead until the butter becomes fully incorporated and the dough becomes smooth, begins to form a ball, and clears the sides of the bowl. Add up to ¼ cup more flour, one tablespoon at a time if the dough is too sticky. Place dough in a bowl, cover with plastic wrap, and refrigerate for one hour. 2. Place the 2 ½ sticks of butter and 1 tablespoon flour into the bowl of a standing mixer with the paddle attachment. Beat until butter is uniformly smooth and creamy. 3. Turn dough out onto a floured work surface. Roll dough into 10 x 14-inch rectangle. Spread butter evenly over the bottom 2/3 of the rectangle. Fold unbuttered third onto the middle third. Brush away excess flour with a clean pastry brush. Then fold that onto the bottom third. Seal edges with side of your hand. 4. 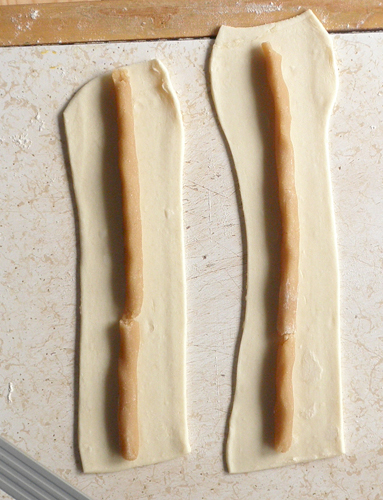 Using a rolling pin, gently whack the dough, starting at the center of the dough and go outward. 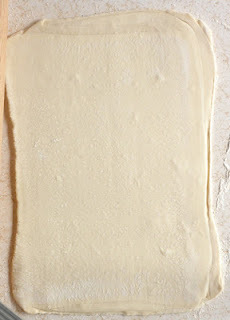 Then gently roll the dough into about a 7 x 12-inch rectangle, and fold into thirds again. Make sure that the butter doesn’t break through. IF it does, sprinkle with flour. Fold the square into thirds to form a long rectangle, brushing away excess flour as you fold. Wrap in wax paper and then place in an unsealed gallon size plastic bag. Refrigerate for about 30-45 minutes. 5. Remove dough from refrigerator and remove from bag/wrap, and on a floured surface, gently whack and roll into a 10 x 14-inch rectangle. As in step four, fold dough into thirds and then fold one last time so you have a square again. Wrap and refrigerate again for 2 hours to overnight. 6. Mix the brown sugar, cinnamon and salt with a fork and set aside. 7. Line two baking sheets with parchment paper. 8. 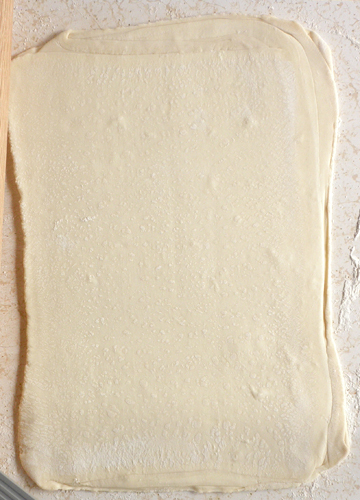 Remove dough from refrigerator and roll into a rough 16” x 16” rectangle about ¼” thick. Evenly spread the brown sugar/cinnamon mixture over the surface of the rectangle, leaving about 1 inch clear at one end. Gently press sugar down with the flat palm of your hand. Starting at the edge opposite the unsugared edge, roll the dough into a log. Gently pinch the seam to seal. 9. With a very sharp knife, trip off ends. Cut log into 12 equal pieces. Press one side of each roll into macadamia nuts. (If not many pieces stick. 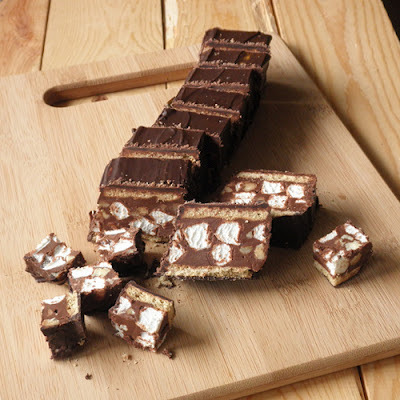 Sprinkle 1- 1 ½ tablespoons nuts onto baking sheet before placing roll on top.) Place rolls on prepared sheets, nut-side down, cover with plastic wrap, and let rise until puffy, about 45 minutes. *Note: you can make these without the nuts as well. 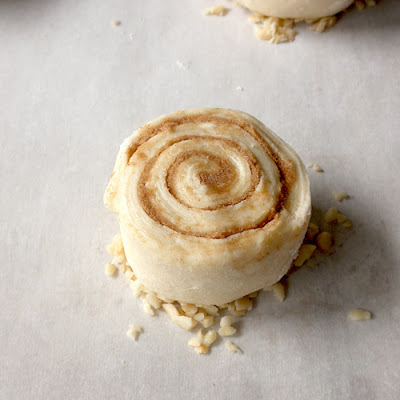 Just skip this nutty step and place cut rolls on the baking sheet, let rise, and bake the same. 10. Preheat oven to 400°. Place one pan in refrigerator until the other is done baking. Whisk egg wash ingredients in a small bowl and brush each roll with it, on the sides and top. Bake for 13-15 minutes, until a deep golden brown color all over. 11. Remove pan from the oven and let cool for 5 minutes. Slide parchment with rolls onto wire rack to cool. 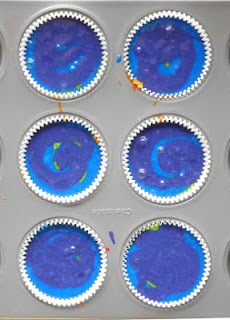 Allow to cool at least 10-15 minutes before frosting. Repeat with other pan. 12. Melt white chocolate in microwave then drizzle over tops of rolls. Just so you know what it looks like unbaked. You can see the flaky layers better before it's frosted. I've made soooo many cinnamon rolls since I started baking competitively, that I really can't eat them any more. I mean, I can't eat the traditional cinnamon rolls. I can't even tell if they taste good, and the last couple I tried to eat, I couldn't even finish the one bite I took, because it made me feel queasy just to taste them. 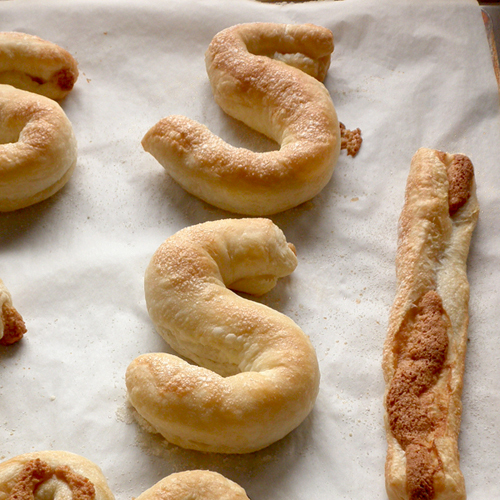 These, though, made with croissant dough are different. They're crisp on the outside, buttery flaky, and don't really resemble a regular cinnamon roll at all, except for the cinnamon swirl. These are so decadent, and so fancy, that I don't make them very often. That's why it's taken me so long to blog about them. Actually, this batch is half of the batch of White Chocolate Macadamia Nut Cinnamon Rolls I made in honor/protest of the 2012 Iowa State Fair Cinnamon Roll Competition. 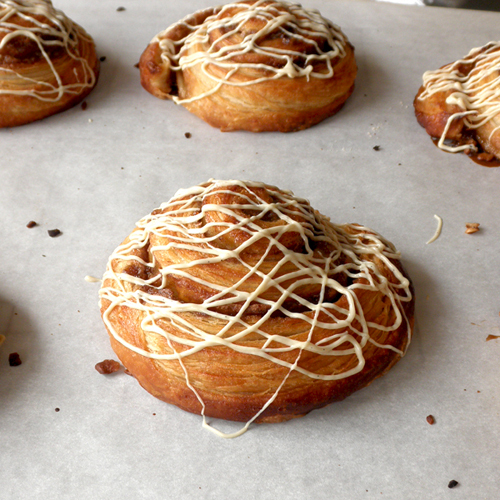 See that post if you want to read a very long story of my cinnamon roll competition ups and downs. Suffice it to say here, that if you're up for making croissant dough, you might want to try these. Honestly, I've made croissant dough enough that it's really not that difficult, just time consuming with the cleanup. 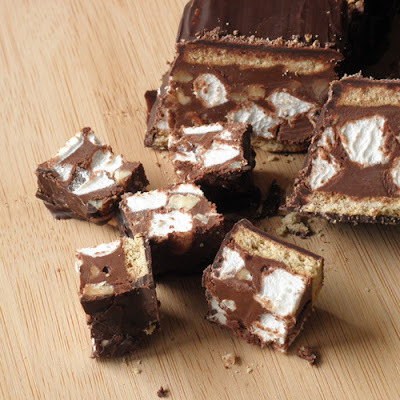 I need lots of space to make these, which means I have to clear off my normally messy counter. I should probably make these more often, just as a reason to clean off the counter. 9. With a very sharp knife, trip off ends. Cut log into 12 equal pieces. (Actually, I like to cut off about an inch from each end before cutting my 12 pieces, so that I get evenly sized rolls in the end. Then, you end up with two little extras for tasting.) Place cut rolls on the baking sheet, at least three inches apart. Let rise for 45 minutes, or until rolls are puffed and leave an indentation when gently poked on the side with a finger. 12. Whisk glaze ingredients together in a small bowl until smooth. Drizzle over warm, not hot, cinnamon rolls.